Spokane is home to the 2008 Memorial Cup Champion, Spokane Chiefs hockey team. Also the three time defending conference champion Spokane Shock arena football team. The Spokane Indians baseball team offers a great outdoor family atmosphere. Four college or University teams call Spokane home, the Gonzaga Bulldogs, the Eastern Washington Eagles, the Whitworth Pirates and the Community Colleges of Spokane Sasquatch, Spokane also offer’s numerous high school events to watch. If there is any single event that signifies the beginning of spring in Spokane it is the thousands of people who begin training for Bloomsday each year. As people are certain the snow is gone and can feel the weather getting warmer, they put on their running shoes and begin the process to get ready for the 12 Kilometer Race held the first weekend of May each year, known as Bloomsday. The Lilac Bloomsday Run was born during the running boom that swept the nation in the late 1970s. 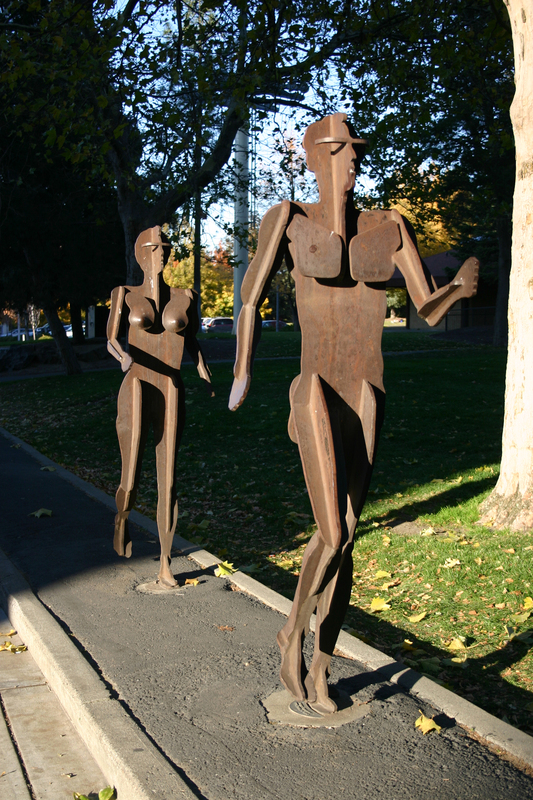 First ran in 1977, the 2001 event marked the 25th anniversary of the largest timed road race in the country. After twenty-five years, Bloomsday has worked its way into the fabric of life in the Inland Northwest. For most residents, it's impossible to imagine spring in Spokane without Bloomsday. Included in the 50,000 plus people running Bloomsday are elementary school students, high school track teams, families walking the course together, senior citizens doing it for the first time, world-class wheel chair participants, joggers with strollers, and some of the world's top long distance running competitors. In short, the race attracts just about everyone. The 12K (or 7.46 mile) race starts downtown on several of the main streets, runs out west of downtown along the river, goes by Spokane Falls Community College, crosses the river, goes up the infamous 'Doomsday Hill' and finishes up near the courthouse on the north bank of the Spokane River near Riverfront Park. There is also a Junior Bloomsday more recently named America's Kid's Run held at Joe Albi Stadium north of town for the more controlled environment for smaller children. This is usually run in the middle of April, 2-3 weeks before Bloomsday. More than 9000 four to twelve year olds will be running and walking a course ranging from 1/2 mile up to 2 miles and this is the world's largest children's running event. At the end of June each year, tens of thousands of people crowd nearly every downtown street, parking lot, Riverfront Park, and most of the parking lots and streets on the north bank of the river with '3 on 3' basketball enthusiasts. There are children's brackets, family teams, co-ed brackets, men and women's brackets, 6-foot and over brackets, elite teams, and a wheelchair division. Hoopfest has gone from 2000 players in its first year to over 20,000 in years past. More than 100,000 people will crowd the streets as participants, volunteers, or fans to cheer on their favorite teams. 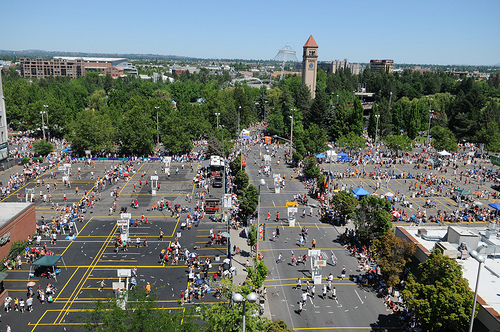 There are no words to aptly describe how well this event is organized, people come from all over the region to watch and play; while Bloomsday is Spokane's most famous event, Hoopfest has quickly become its most popular.